Forage fish are a critical part of the Puget Sound food web and fill a niche between plankton and salmon. Very little is known about these fish, so along with three of its most passionate volunteers, MSFEG embarked on a year-long study of forage fish at Carkeek Park. 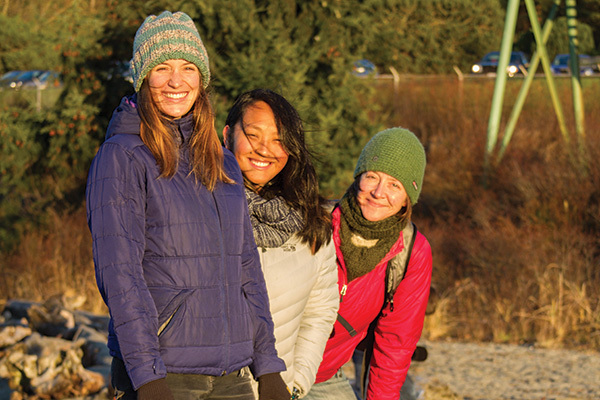 Each month, Christina Hersum, Vera Hoang, Gail Pethe, and MSFEG staff collect samples at low tide using protocols developed by the Washington Department of Fish & Wildlife (WDFW). The data collected will be used to answer basic questions, such as: Where do these fish spawn? At what tidal elevation? During which months? These volunteers are dedicated to science—and to educating the public about a type of fish that so few people know about. Sand lance? Surf smelt? Most people will give you a blank stare. But with more data and more studies like this one, we can educate people about the importance of forage fish—and what can be done to protect them. MSFEG is pleased to be actively working with the WDFW and the American Fisheries Society on a cutting-edge issue for Puget Sound. Mid Sound Fisheries Enhancement Group (MSFEG) works with communities to maximize self-sustaining salmon populations. In King and Eastern Kitsap Counties, we work cooperatively with private landowners, agencies, tribes, and others to identify, design, and implement projects that improve salmon habitat.